The Bridgestone Driveguard all season tire allows you to drive up to 50 miles at up to 50 mph after a puncture or complete loss of air pressure. Bridgestone Driveguard tires were specially designed for year-round driving flexibility by offering excellent handling, traction and control on both dry and wet roads and in light snow. The Bridgestone Driveguard all season tire allows you to drive up to 50 miles at up to 50 mph after a puncture or complete loss of air pressure. Bridgestone Driveguard tires were specially designed for year-round driving flexibility by offering excellent handling, traction and control on both dry and wet roads and in light snow. 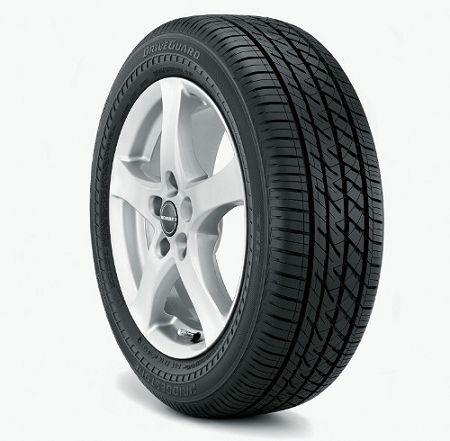 For the Bridgestone Driveguard tire, call or order from our online tire store today. Bridgestone Americas Tire Operations is the product of the merging of two of the finest tire manufacturers in the world: The Firestone Tire & Rubber Company, which was founded in 1900 and the Bridgestone Tire Company Ltd. (later renamed Bridgestone Corporation) which was founded in 1931. Bridgestone Corporation purchased Firestone in 1988 for $2.6 billion, transforming the companies’ combined operations into the world’s largest tire and rubber company. The company has many divisions that help serve all of their customer’s needs. Bridgestone Americas Tire Operations sells tires for passenger, light truck, truck, bus, off road, motorcycle, agricultural and kart applications through a variety of different outlets, including independent dealers, discount retailers, warehouse clubs and stores owned by Bridgestone Retail Operations, LLC (BSRO). Today, Bridgestone Americas consists of an international family of enterprises with more than 50 production facilities and more than 43,000 employees throughout the Americas.